As we creep ever closer to the beginning of the GRLCS Spring Split (start date: February 9th), we have begun to notice a disparity between the number of free agents drifting around and the number of teams seeking new players. Despite the abundance of players hopeful to join in on the GRLCS fun, free agents tend to shy away from taking up the mantle of captain and forming their own teams. 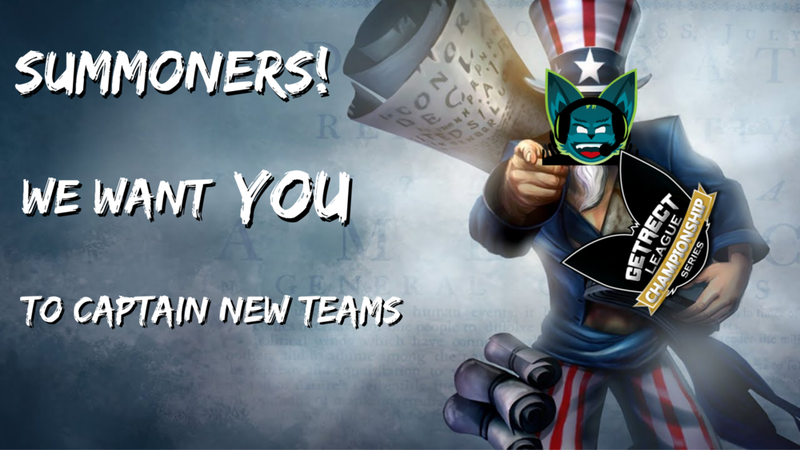 While we wait to hear back from eharmony on that, we believe that we can best help free agents become a part of the GRLCS by seeking out people who are interested in taking the initiative to captain a team. While it’s not all sunshine and daisies, the duties of a GRLCS captain are nothing to fear, and taking them up allows more people, including YOU, to participate in a fun, competitive, but most importantly, community-driven, league experience. “If we don't have captains, we don't have teams. We need captains in order to recruit people and make teams. (…) My team started out as only myself and my wife. I asked several friends IRL and only one said yes. Then we started to build a team using the free-agency [resources] within GetRECt. (...) After several months we've come a long way. We now have a very well established team that all want to improve and ultimately do well in this tournament together. (…) I would say that if you want a very rewarding experience where you can guide a team from nothing into something extraordinary and are up for the challenge, become a captain. It goes without saying that a captain needs to assemble their team. The players you choose as teammates may be friends who are interested in participating, or it might involve reaching out and contacting other free agents looking for a team to call their own. You can hold tryouts if you want, or you can choose your team according to any criteria you deem important. GetRECt has the Free Agency Assistance page to try and help interested players and teams find each other, but there are a number of online communities where players can be sought out as well. At the end of the day, this first step can be as intensive or relaxed as you want it to be; it just depends on the vision you have for the team and what kinds of players you are looking for. Whether you’re playing competitively and to win, or you’re playing to have fun, seek out players who have with the same goals as you do. Pro tip: always consider availability of schedule when choosing people to join your team! Scheduling is the biggest responsibility of being a team captain. Basically, scheduling involves reaching out to the captain of the team you’re scheduled to play against next, and working out with him/her the best day and time for your match to be played. It may sound easy enough and sometimes, it is. Sometimes though, neither team has full availability on the same day which may require compromises in the form of substitute players. Sometimes an opposing captain may be not the greatest communicator. GetRECt has implemented changes that should mitigate some of these scheduling issues and improve our ability to resolve disputes, and ultimately, if you’re responsible and reasonable, you won’t have any problems with this part of the job. GetRECt will look out for you! A few tips on making scheduling easier for yourself: be open to compromise on having your full starting roster for every single match, have a few substitute players on standby or keep a starting lineup with a relatively open schedule. Because of the length of the season, issues outside of game may arise for players that demand their attention during a particular week. Substitute players are a common part of participating in the GRLCS, and every team should be ready for the possibility that they might need to use them. By comparison, the post-match form is a very simple procedure! After your team wins a match, as captain, you will need to fill out a form that lists information, including your team, the opposing team, and any substitute players, as well as attaching the .rofl (replay of League of Legends, downloadable from the client itself) files from the matches. This last step is incredibly important, as it is what allows your match to be streamed with commentary, one of the most fun and enjoyable parts of the league! The losing team never has to submit this form, only the winning team, so if you’re just playing for the fun of it and don’t win often, this responsibility is even less of a burden for you. Even if you win, the form itself takes less than five minutes to fill out after you’ve won your match, so it’s a very easy process once you know what you need to do! The last requirement of a GRLCS captain is to complete the registration form for the GRLCS prior to the start of the split. This involves paying the one-time team entry fee, so make sure you and your teammates understand how payment is to be collected. You can find everything you need to know about registration, covering your team’s entry fee, and individual registration here! Congratulations! You’re now a GRLCS Captain! Everything else is up to you and your teammates. It’s your team, after all! How often you practice, scrimmage, or anything else you and your team want to do internally is up to you. Some teams don’t practice, some teams practice a lot. It all just depends on what you and your teammates want to get out of the GRLCS. Feel free to ask any remaining questions you might have in the comments or via Discord! We hope you consider becoming a team captain and forming your own team, the free agents need you, and it can be a lot of fun! Our thanks go out to current and past GRLCS captains for their input over the seasons and the quotes used in this article.